Oakleigh Mechanics’ Institute. First Built on this site in 1886. The Mechanics' Institute movement began in British urban industrial centres in the early 1800s. A "mechanic" was a person applying skills and technology. During the 19th century, most towns in Victoria established a Mechanics' Institute or Athenaeum with a library and meeting hall. Common objects were the "spread of useful knowledge" and provision for "rational recreation" in the community.This plaque, No. 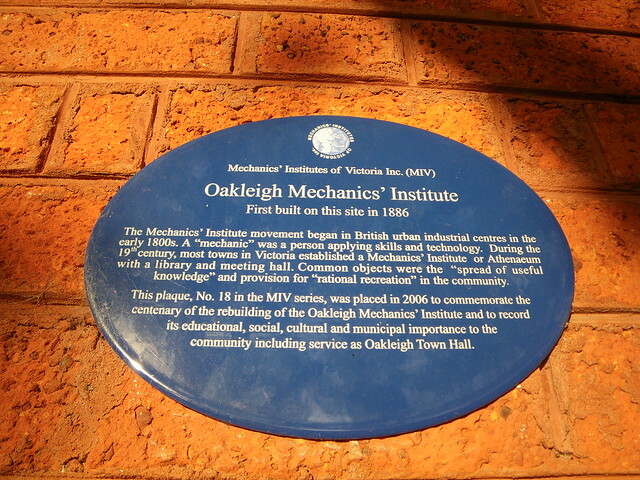 18 in the MIV series, was placed in 2006 to commemorate the centenary of the rebuilding of the Oakleigh Mechanics’ Institute and to record its educational, social, cultural and municipal importance to the community including service as Oakleigh Town Hall.